Pizza for Christmas? Why not! 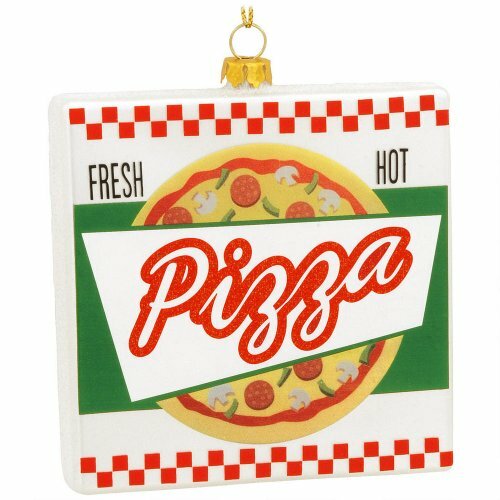 At least, there's no reason not to celebrate your love for pizza with some fun novelty ornaments for your Christmas tree. The classic baked pie of tomato sauce and cheese with toppings is one of the world's most beloved foods, and it's even got all of the classic colors of Christmas: red (sauce), white (mozzarella) and green (basil, oregano and other spices). 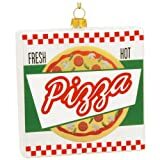 Here you'll find a variety of pizza-themed decorations: glass ornaments shaped like pie slices, pizza chefs, and even ideas for making your own pizza-themed decorations. Enjoy! Grab a slice of pie...for your Christmas tree! Glass ornaments are always a classic, and those below are a colorful assortment of pizza slice-and-pie themed glass ornaments for your tree! They come in a variety of sizes and styles, but all of them are delicious looking...and fun. Get an assortment to theme your tree, or just one as a gift for a pizza-loving friend or family member. As of 2007, there were over 75,000 pizzerias currently in the United States. October is national pizza month in the United States. Worldwide, over 5 billion pizzas are sold every year. What are the most popular days for ordering pizza? Super Bowl Sunday, New Year's Eve, Halloween, Thanksgiving Eve andNew Year's Day. Pepperoni may be the most popular pizza topping in the US, but around the world you'll find quite different tastes. In Japan eel and squid are favorites, and in Russia it's red herring. New York City restaurant Nino's Bellisima Pizzeria claimed to sell the world's most extravagant pizza. At $1,000 a pie, it is topped with six different types of caviar and of course, lobster. But Margo's Pizza on Malta has them beat with a $2,400 pizza topped with white truffles and gold leaf. For more fun pizza facts, check out pizza.com and Food Trivia & Food Facts pizza page. How about a Christmas-Themed Pizza? Pizza's on the way! This fun glass ornament looks like a snazzy, classic pizza delivery box. 3 3/4" high, it's large enough too to really stand out on your Christmas tree. Santa's on his way...only this year he's got something extra special for a pizza lover! 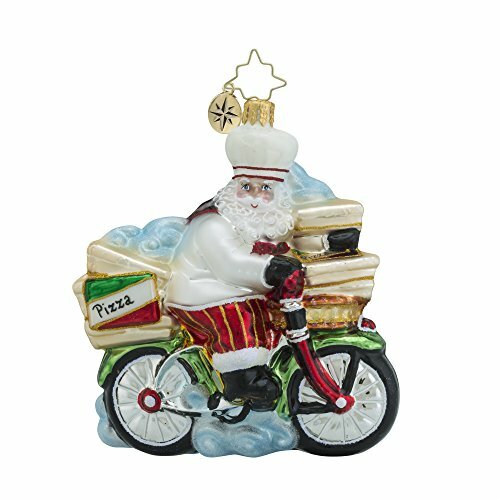 This adorable glass ornament shows Santa making a real special delivery...pizza via bicycle. This ornament is hand-painted and made with traditional European craftmanship. 4" in size, it will really make a statement on your tree as well. You'll want to dig into a slice of this pie! Another glass pizza ornament, this one featuring a whole cheese pizza ready to be served up and enjoyed. It's large enough in size to stand out and features the whimsy, color and detail you'll find in all Kurt Adler Christmas ornaments. Classic margarita: tomatoes, mozzarella, and basil. Pepperoni, please! The U.S. favorite. Meat-lovers: just pile on the sausage, pepperoni, bacon, everything! Hawaiian: pineapple and ham is yummy! BBQ chicken - an American classic. Any...as long as there are NO anchovies! 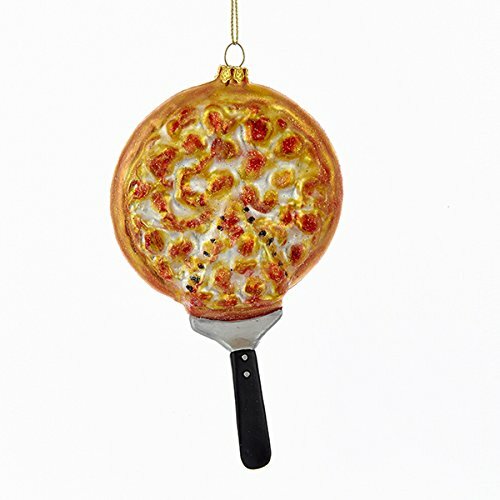 Want to Make Your Own Pizza-Themed Christmas Ornaments? Pizza Ornaments | Cut Out & Keep - a simple and inexpensive craft project using felt and acrylic paint. 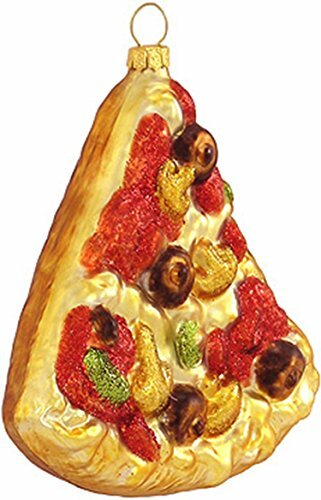 Polymer Clay Pizza Ornaments - if you enjoy working with clay then you might want to try making something like these cool ornaments, featured on deviantArt. Naples, Italy is historically important for many reasons - and pizza is certainly one of them! Learn about the history of pizza and why it is so associated with this city in Campania. Want to try making an unusual but delicious pizza? Try my rainbow chard pizza, perfect when colorful chard is in abundance at the marketplace. 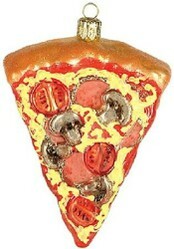 Those pizza ornaments are so cute - I love them!